Five migrants have died as a German NGO and the Libyan coast guard tried to rescue them from their sinking dinghy in the Mediterranean, with each side blaming the other for botching the operation. Germany’s Seawatch said its rescue ship was helping dozens of migrants on the deflating boat in international waters off the Libyan coast on Monday (Nov. 6 ) when a Libyan coast guard boat also began to take migrants onboard. Seawatch said the Libyan coast guard caused panic by “beating and threatening” the migrants, before driving off at high speed with people still latching onto the side. The victims include a child the Seawatch medical team was not able to revive, the non-profit said in a statement on its website, blasting the Libyan coast guard’s “violent and reckless behaviour”. The Libyan coast guard said the German NGO had undermined its rescue operations by approaching its boat. 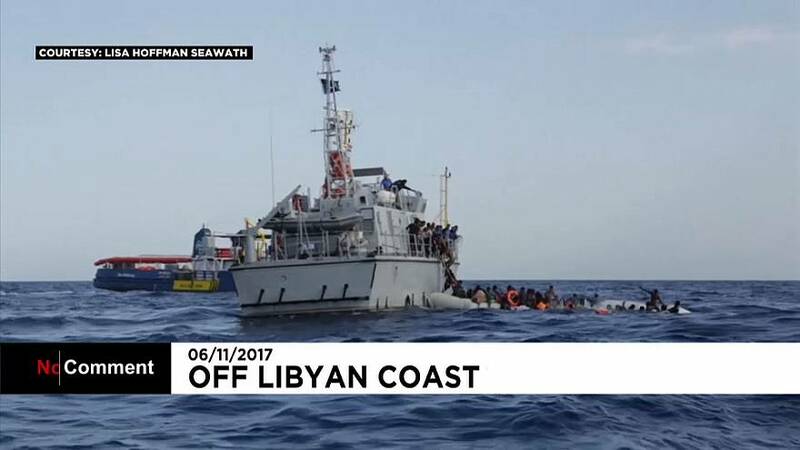 A video obtained by Reuters on Monday showed how some migrants tried jumping off the Libyan patrol boat to reach the Seawatch ship a few metres away. Over 152,600 migrants have arrived in Europe by sea and 2,836 have either died or gone missing in the attempt so far in 2017, according to the UN High Commission for Refugees. Italy has recently boosted cooperation with Libyan authorities to prevent migrants from making the dangerous journey across the Mediterranean. Human rights group Amnesty International has warned that “outsourcing” the fight against smuggling to Libya exposes migrants and refugees to abuse.